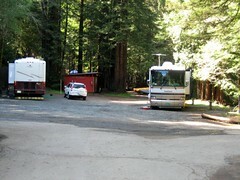 FAQ | RV There Yet? FAQ – So, where are you from? Perhaps it was our time in central Mississippi where we only had to greet the check-out person for them to know we weren’t from “‘round here”. Maybe it was the SOWER Rally in March where we met so many new folks. Or maybe it was just being greeted at church by someone who recognized us as a visitor. That is a pretty simple question for most folks. And in the early part of our journey, it was pretty simple for us too. Pennsylvania. But after almost 14 years as full-time travelers, it’s getting harder and harder to answer. 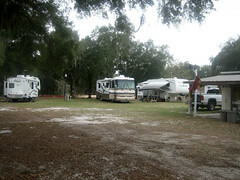 First we changed our domicile to Florida, but having never actually lived there (or even visited the town where our address was) we certainly never considered ourselves Floridians in any way, shape or form. Recently, we became Texans. Now, while we actually own property in Texas, vote in Texas, have our vehicles registered in Texas, and generally love Texas (well, except the summers maybe), we don’t really consider ourselves From Texas. (Besides, we have yet to purchase our first pair of cowboy boots.) But still the question is asked. 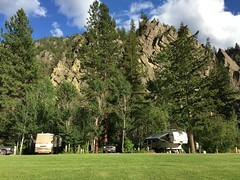 “We raised our family outside of Philadelphia, but we’ve been living in our motorhome for the last 13+ years, so right now we’re from [insert where we are parked]. Depending on their response, either a glassed over look of “are you homeless or what?”, or a delighted “Man, I’ve always wanted to do that”, we’ll elaborate (or not!) a bit more on what exactly we do and why we love it. Well, five thousand and thirty five days later the answer is an unequivocal – YES!! Several of you have asked why we made the ‘move’ to Texas. How come? Why now? So before I get into the full explanation, let’s talk for a moment about “Domicile”. For those of you living in a house or an apartment, domicile is easy. It’s simply where you live. For those of us who move every three weeks or so, it’s a bit more complicated. Not only is there the ‘where do you get mail?’ problem, but the state and federal governments really, really, really want to know where you ‘domicile’. There’s this thing called Taxes that they seem pretty particular about. FAQ – Just what is it that you do? Lots of folks that we meet along the way are curious about the work we do as SOWERs, so I thought I’d do a couple of FAQs about SOWERS. In a nutshell, just what is SOWERS? 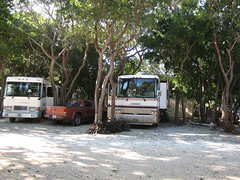 SOWERs– an acronym for Servants on Wheels Ever Ready – is a 501c3 ministry made up of born-again C hristians with RV’s who travel to a variety of Christian ministries, i.e. churches, camps, conferences centers, orphanages, schools, missionary retreat and training centers, homes for abused children, and recovery homes for adults in the US and Canada, and provide volunteer help for three weeks at a time. 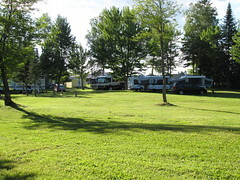 These partner ministries provide an RV hook-up for the duration of the project, and allow volunteers to stay for an additional week if they so choose. What are the requirements for becoming a SOWER? The most important requirements are a love for Jesus and a heart for service. There is an application process, of course, which involves a form (to be filled out by both husband and wife) that includes your testimony, a letter of recommendation from your pastor, and an FBI fingerprint background check. Once you have submitted all of those items, that information will be sent to a Trustee (we are governed by a 9 member Board of Trustees), and he/she will set up a phone interview. Once all those step have been completed satisfactorily, you’ll be eligible to sign up to serve at our ministry partners. How do you find out about different ministry needs, and do you get to chose where you go or are you assigned? SOWERs has an online listing that is updated weekly, which details all the openings at our partner ministries throughout the US and Canada (about 170 total). 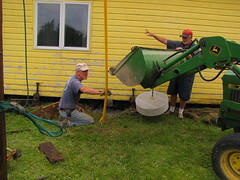 It also gives a brief description of the type of work they are hoping to accomplish. Each SOWER couple is self-directed. Once we determine the ministry where we’d like to serve, we sign up through the SOWER office (via email), and the office confirms our placement and lets the ministry know that we are coming. It seems like you guys work at a lot of different locations and most every month. Are SOWERs required to work a certain number of months a year? Well, if you’ve read any of my SOWER related posts, you know we do whatever we are asked to do! We rarely work ‘in’ the ministry, but instead take care of the physical /maintenance things that get in the way of the ministry being able to do what God has called them to do. The men do a lot of construction and building maintenance, and the women seem to concentrate on painting, housekeeping, kitchen help, sewing and tutoring. I’ve occasionally worked alongside Gary as his helper, but that most likely happens when we are at a ministry alone. Every ministry has different needs, and we try to help out to the best of our abilities in whatever we are asked to do! Another No. All SOWERs are self-supporting, and receive no compensation for their service. We get ourselves there, provide for ourselves while serving at the ministry, a nd get ourselves to our next location (or home!). Our payment is immense, but intangible. We get to bless ministries by standing in the (maintenance) gap for them, and in return we are blessed by seeing God at work in these ministries. Like I said – it’s huge! 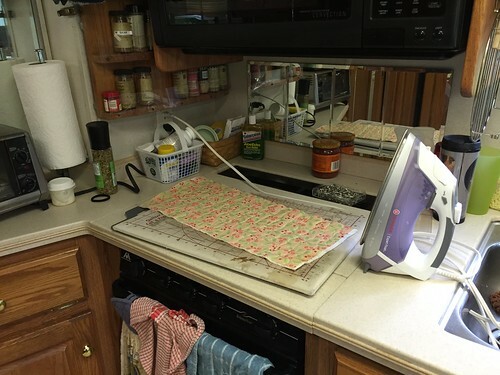 FAQ #9- Can you really sew in your RV? 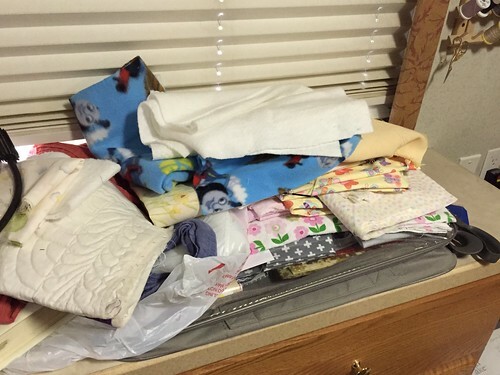 If you sew in an RV … you have to clean up your mess and put everything away each and every time you sew! That is too awful! 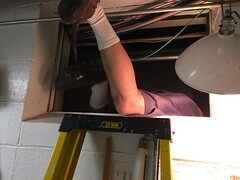 How do you manage that? I have a sewing/embroidery machine combo plus a serger. Six thread boards (and that doesn’t count the bins full of overlock cone thread!). Ironing board and iron. 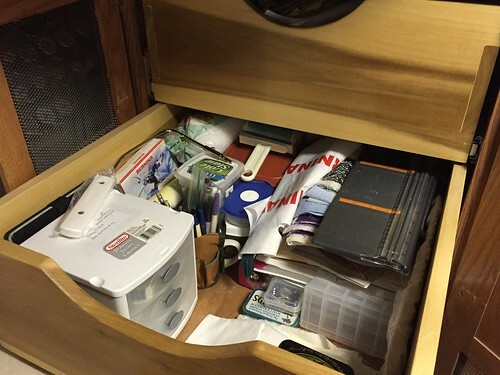 Drawers filled with supplies and tools. Two coffin-size plastic bins filled with fabric hanks and scraps. 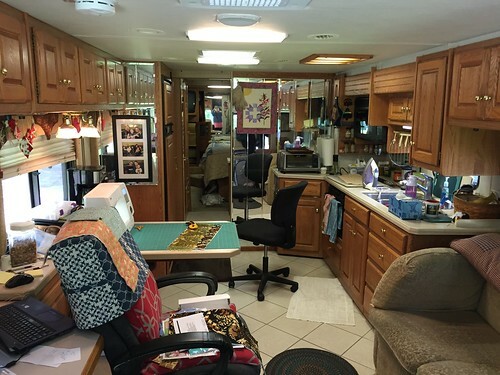 And you really sew in an RV? 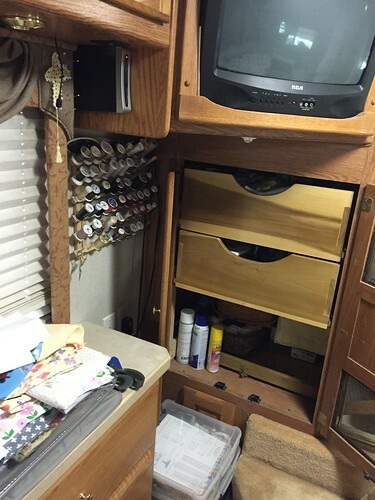 Well, the simple answer is – Yes, you really can sew in an RV. You can also knit, crochet, make jewelry, design cards, scrapbook, or even paint. 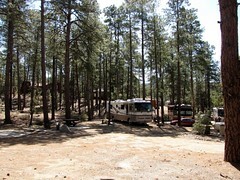 Almost any hobby that you love doing you can do in an RV. It’s just going to look a bit different. And probably on a smaller scale. 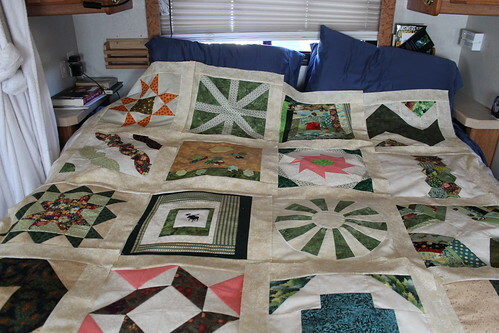 I’ve laid out a good many quilts on that design bed. It’s pretty portable, so you can always move it when you need to make lunch. 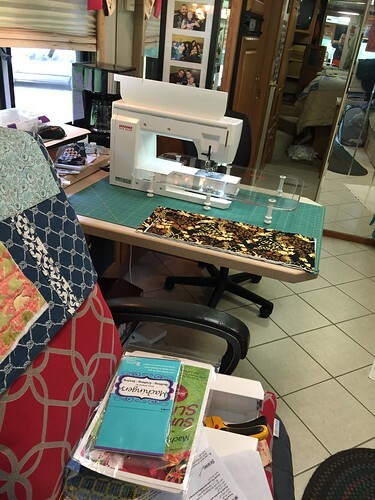 The cutting table and the sewing space – well, share and share alike, I always say! And when the computer chair isn’t being used for overflow supplies, it can also double as the table extension when you’re working on an extra large project. Of course, there are always some storage issues in any hobby. 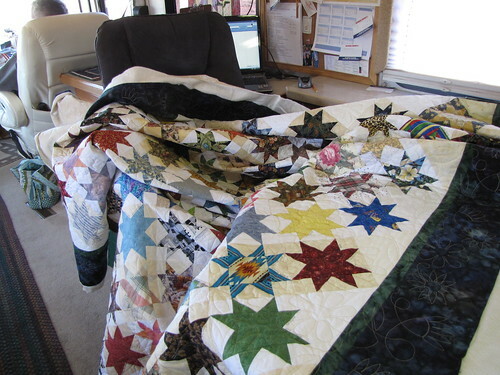 Sewing/quilting is no exception. We’ve taken the space that could have housed a washer/dryer and built in deep sturdy drawers with a sliding tray at the bottom. The thread lives on the wall, and the bins on the floor hold (you guessed it) more fabric and supplies. Not pictured are the two “under bed” size containers in the closet and any number of boxes of odds and end (fabric, batting, t-shirts waiting to be made into a quilt, etc.) under the bed. And sometimes, the little bit of counter space that I have in the bedroom also falls prey to a bit of overflow sewing stuff. 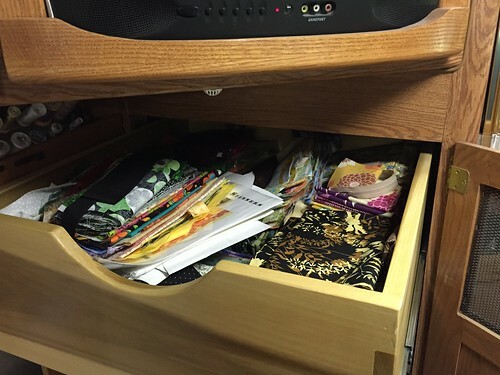 While some folks have managed to carve out a designated sewing area in their RV’s, (check out this post from a fellow quilting RVer) I have not figured out just where that spot would be. 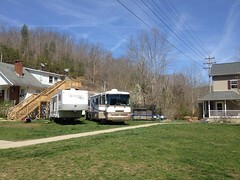 Pretty much, when I’m sewing, the whole RV is sewing! And yes, I do need to tidy up at the end of each sewing day in order for us to actually eat dinner. But I really only need to put it ALL away before we move the house down the road. If I know that our life is going to be very busy, I just don’t get the machine out. I wait until I see a quiet weekend ahead, have leftovers in the fridge (or know it’s time for a pizza night) and THEN I get out the machine and start a small sewing blitz. It also helps to have a patient husband. As long as he can find a spot for a nap, we’re usually good! I like to think that quilting/sewing (painting, beading, knitting, scrapbooking, whatever hobby makes you happy) in an RV is like eating frozen yogurt. As long as you don’t think it’s going to taste like Blue Bell ice cream, you’ll like it just fine! What did you do with all your stuff? I can’t even begin to think about sorting through all these years of “Stuff”. Man, did we have some stuff! 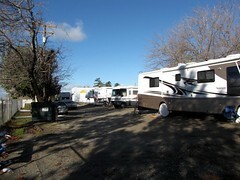 3500+ square feet of stuff. 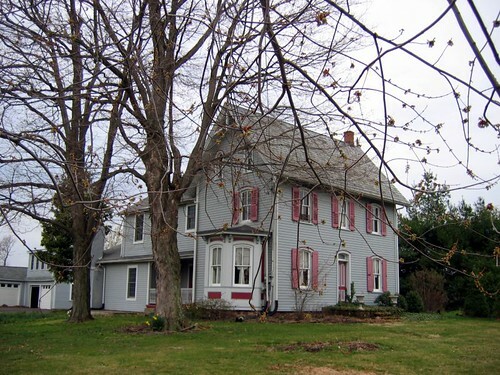 We’d lived in that old house for almost 25 years and trust me, you can accumulate a lot of Stuff in that many years. 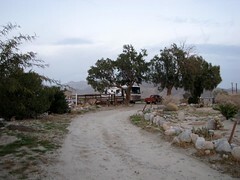 We had kid stuff, collectible stuff, Mom’s stuff, Grandma’s stuff, sewing stuff, tool stuff, old stuff and new stuff. Fortunately, I had over five years from the first mention of this adventure to the day that we actually took off, so I was able to get a head start with the liquidation of the Stuff. Every Spring (and then sometimes in the Fall, too)I would have a yard sale, getting rid of the easy stuff. You know, those placemats you never really liked and that ceramic statue your favorite aunt gave you that never quite made it out to a shelf. For me it was kind of like peeling an onion. Every year I would just get rid of another layer of stuff. If it didn’t sell, it wasn’t allowed back in the house – off to the local thrift shop it went. Each year that went by, more stuff moved into the “do I really need this?” pile and less stuff remained in the “must keep” pile. Oh, I made sure that the kids got what they wanted (not to mention all their old report cards and other early years memorabilia) and that precious family heirlooms were distributed appropriately. With the exception of a couple of pieces of furniture we left for our house sitters to use, by the time we hit the road in 2004 we had boxed up our remaining “must keep” stuff and had everything contained in one small room in the back of the house. The “For Sale” sign was firmly in place (of course, it had been there for a while without much action), we’d kept (what we thought were) the essentials and we were on our way. 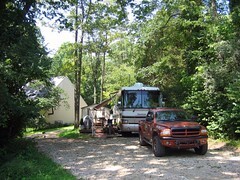 We returned to PA after a year with a new understanding of our adventure. Instead of this being a one or two year adventure, after which we would purchase a small house and go back to work, we realized we didn’t want to have an “expiration” date on this journey. So I went through all those boxes and had one final Yes-this-is-the-good-Stuff yard sale. The last of the furniture went to family and friends, and we whittled down our “keeper” boxes to about 15. The house still hadn’t sold, but I wanted it to be as ready as possible, so we moved those last boxes into a small unused space in a friend’s basement. A couple of years later (remember, no known expiration date) we moved those boxes to our son’s house in Ohio. And every year or so, during a visit, we’d pull out a box and see just what still needed to be kept. It only took us 10 years, plus those five to start with, but I think we’ve done pretty well. 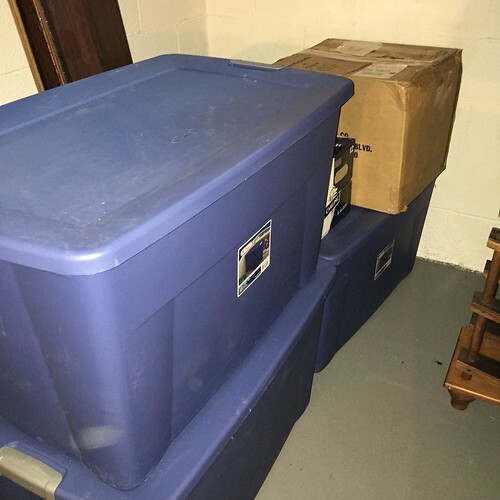 Full Disclosure – just because we’ve condensed our ‘previous lifetime’ into 3 plastic tubs and a cardboard box (and the box is headed to the cabin!) that doesn’t mean we’ve actually conquered the “stuff” battle. Whether it’s 3500 sq. ft or 300, stuff just accumulates. We try to stick to the one in-one out (or one in-two out) rule, but a quick peek at the under bed storage compartment will tell the tale. And no – there will not be a picture of that!